The Order Diptera, the two wings. Dawn of the Fly is a historic account of the great world war dubbed “The Order Wars”. No information remains to which power was to blame for the start of the worst world war ever known to man. We know that high level research was done with insects, especially fruit flies, doubling there life expectancy! This was a great achievement for mankind for it was another step closer to immortality. Where it went wrong, no one quite knows. The ruling powers probably overlooked the fact that one pair of flies can produce more than one million offspring in as little as six to eight weeks. So double the life expectancy of the fly and of It’s offspring. It was the beginning of something immense and so horrible, that it will always be known as “The Dawn Of The Fly”. The last remaining human outposts are on the polar caps, where it is still too cold for flies to survive. The cities are stretched to the brim, time running out, ravaged by civil wars, people relentless to give up their space to another man. Outside of the polar caps a great war is upon earth. A force has been gathered to eradicate the earth of the flies, and free humankind from the most colossal threat it has ever faced! The specs! The specs! All look the same! The glowing brine. The soft black rain. 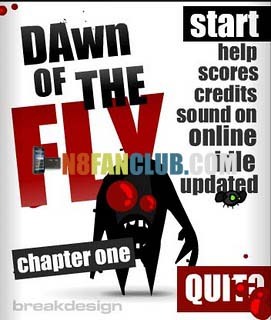 Dawn Of The Fly is back!!! This time the flies have risen for revenge! Compatible with S^3 / Anna / Belle Smart Phones.